June is here, the sun is shinning we are looking at blue sky's again, it is wonderful! We always have some of the most delicious food at this party year around but the summer is very special because we have our canning and preserving addition with weekly features, be sure to link your awesome canning and preserving recipes to this party with features all summer. Another place you can link your canning and preserving recipes is our canning and preserving recipe box, it is a great resource. I can't wait to see what you are sharing with us today so lets get this party started! Thanks so much for the party Miz Helen! Aren't these sunshiny days awesome after all of our rain? I like the food mosaic that you made. Thanks so much for hosting and sharing. Thank you for the party, Miz Helen! The features are just beautiful, and those canning recipes are a treasure. Thank you for putting them together for us! Hope you're having a great week! I'm so excited to be a part of another one of your awesome parties! Thanks so much, Miz Helen! I crack up when you say the greatest cooks gather here. I don't fit that description, but I appreciate you letting me join the club. LOL! Thanks so much for the wonderful party Miz Helen. I love the way you fill your plate...and would love to sit beside you and enjoy it with you. ;-} YUM! Have a good week...stay dry and hope you get lots of sunshine. Thanks for the party. Glad you are having a nice being of summer. Ummm, some great entries here. Thanks for hosting, dear one. Hi Miz Helen! I am so glad you are getting some sunshine! It's bright here in the UK this morning too - I'm hoping it continues for the weekend. Thank you for hosting the party. Today I've shared a Strawberry Pudding Cake. It 'magically' separates into two layers - tender cake on the top and a sweet, fruity sauce on the bottom. Have a wonderful weekend! Thanks for the party!! One of my favorites! Love your party every week! And thanks for featuring my smoothie this week. Love the link for the canning recipes! I love preserving the local harvest! Thanks for the party! Everything looks delicious as always! Thanks for hosting! 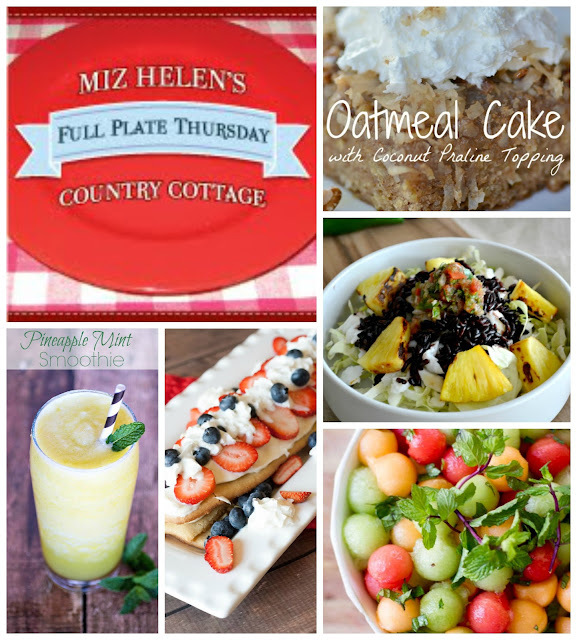 Thank you for hosting this delicious party, Miz Helen, and thank you for sharing your canning recipe box! Hi Miz Helen. Thanks so much for hosting again. I love your recipes and hope it's not too hot yet in Texas. I made a blueberry coffee cake to share this week. I can't get enough of it and have made it twice even though blueberries aren't in season yet in Washington! Have a great weekend! Thank you so much for adding my Peach Cake to your menu this week and for the opportunity to share another cake. Sorry to be so late. I was traveling to Austin to get some more peaches! Best wishes for tasty dishes! Thank you for featuring my Oatmeal Cake! I feel honored to be a part of your special party! Thanks so much for the party Miz Helen. I love your parties. I try to post a recipe each week, so I can come an join your party. It doesn't always happen...but I do try. Dear Miz Helen, A wonderful party!! Hi Miz Helen, I'm so glad to see all the delicious food here this week. I've brought a dish of lean GF Gravy with Mushrooms and Onions, just ready to pour over some pork chops or mashed cauliflower. Thanks so much for hosting Miz Helen! A lot of great stuff linked up this week. I hope you have a magnificent weekend!